New Orleans President Trump could have, and in fact should have, just declared victory over the cowering and hapless National Football League billionaire owners and called it a day, case closed. He had proven that a poorer man could successfully bully a whole gaggle of richer men. For once in his life, he should have just shut his pie hole. But, no, he couldn’t of course, so now the players are going to have to teach him a lesson. Sports betting is now legal. Soon it will be available in your town, too. Delaware jumped off the line first. If you are betting, I’d bet on the players this time. There might be a dozen or so of you out there who don’t know what I’m talking about, so here’s the brief context. Some NFL players, led initially by Colin Kaepernick and then Eric Reid and others, began protesting police brutality and racial discrimination during the anthem before the beginning of football games. Some owners were fine with it, some weren’t. The NFL brass was respectful in the beginning. Before the protests could run their course or lead to some reforms, President Trump jumped into the fracas and tried to claim the protests were unpatriotic. Then it was on! Jerry Jones, the bully-boy owner of the Dallas Cowboys, threatened his players, and away we go. There were stutter steps towards a resolution. Players like Kaepernick filed grievances over collusion to prevent them from being able to work. Secret recordings of the owners’ meetings became public proving how spineless many were. Jones was fined and forced to pay the league’s legal costs for his mischief. Finally, in a ham-handed move the league announced that their players would have to stand or stay in the locker room: no more protests. Trump of course declared victory, reminiscent of George W. Bush on the aircraft carrier, he mistook one successful skirmish for a bigger battle in the war. Whoops! The owners, the league, and Trump forgot about the players when they threw in the towel. Furthermore, the players have a union so the owners can’t simply announce a unilateral change without negotiations, so there’s a problem there as well. Trump then tries to have the standard White House celebration for the Philadelphia Eagles victory in the Super Bowl and suddenly finds out that he can hardly pull a van load of players and Eagles staff to drive the short trip to Washington. 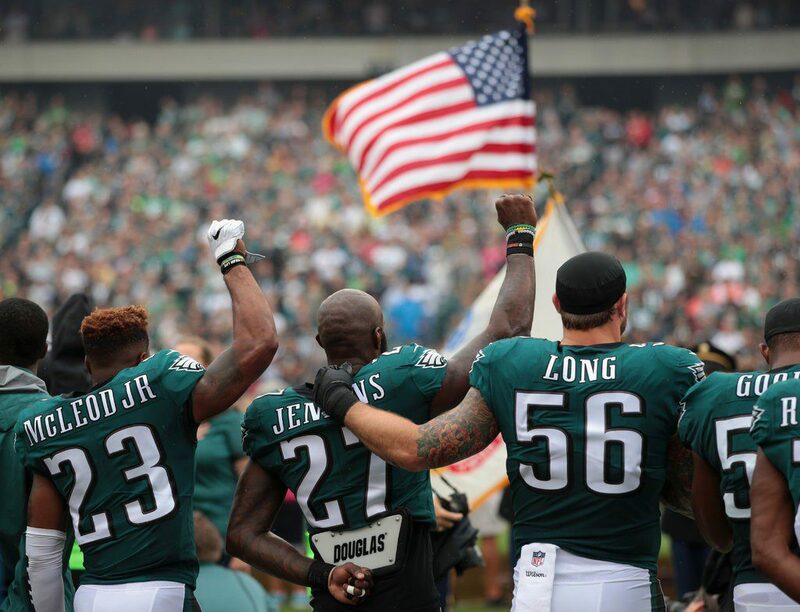 The Eagles players had never even protested during the anthem, but now they are in it to win it on this front as well. We all know what’s coming unless someone puts a sock in Trump’s mouth and the owners grow a backbone. There are going to be whole teams that simply do NOT come out for the anthem and stay in the locker rooms unless this rule is changed. Constitutional lawyers are starting to weigh in now that the new NFL rule is a breach of freedom of speech and illegal. Steph Currey and LeBron James in the midst of the NBA finals have already declined a visit to the White House and others are expressing solidarity with the Eagles and the NFL players. We all know football. When there’s a mess this big and the ball is bouncing all over the field, count on the players to pick it up and run with it. That’s my bet, and I’m sticking to it. This entry was posted in Ideas and Issues and tagged discrimination, football, NFL, President Trump, racism by Wade. Bookmark the permalink.